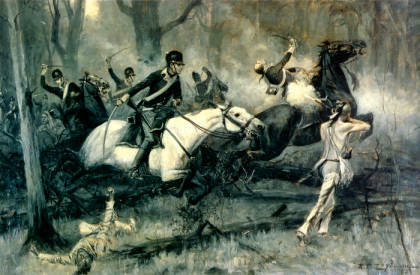 "Charge of the Dragoons at Fallen Timbers," painted by R.T. Zogbaum, ca. 1895. The painting illustrates General Anthony Wayne's campaign against the Ohio natives in 1794. President George Washington appointed Major General Anthony Wayne as the commander of the United States Army in the Northwest Territory. Wayne was instructed to reorganize the mostly state-based militia force into a more professional army known as the Legion of the United States. Ostensibly the Legion’s mission was to pacify the American Indian tribes in the Northwest in order to bring to an end the widespread frontier violence and if possible produce a negotiated peace. Wayne’s predecessors, Josiah Harmar and Arthur St. Clair, both suffered significant defeats against American Indian tribes in the Ohio Country, and Washington hoped that Wayne’s aggressive tactics would prove to be more successful. In May 1793, Wayne arrived with additional troops to supplement the Army of the Northwest, and positioned his army at Fort Washington, near present-day Cincinnati. Wayne repeatedly drilled his troops, hoping to avoid the horrific defeats that befell Harmar and St. Clair. In October, Wayne left the Cincinnati area and headed to Fort Jefferson in Greenville, Ohio, in Darke County. He proceeded six miles to the north of Fort Jefferson and ordered the construction of Fort Greene Ville in Greenville, Ohio. His army remained there for the winter of 1793-1794. He also had his men build Fort Recovery in Mercer County, Ohio, on the site of St. Clair's Defeat. While Wayne and his army continued to carry out military campaigns against native peoples, an American Indian Alliance banded together and was fighting against encroaching settlers in Ohio Country. Little Turtle, chief of the Myaamia (Miami) Nation, led the Alliance, with the help of Tecumseh, who would later become a prominent leader, and Blue Jacket of the Shawnee, as well as warriors of the Myaamia, Shawnee, Lenape (Delaware), Wyandotte, Ottawa, and Ojibwa tribes, probably with members of other tribes as well. After the Revolutionary War, relations between American Indians and Anglo-American settlers were filled with tension and boundary skirmishes as settlers continually encroached on tribal lands from the east and across the Ohio River to the south. Various land ordinances, including the Northwest Ordinance of 1785, created the Northwest Territory. At this time, the Northwest Territory was the region encompassing present-day Wisconsin, Michigan, Illinois, Indiana, Ohio, and parts of Minnesota, which had not been ceded by American Indian Tribes. These ordinances contained some protections for American Indian lands, but they were often ignored by the federal government. Although the Indian Alliance aimed to combat Anglo-American attempts to take unceded lands by force, the Alliance was in no way a united body. Members of the Alliance struggled to abandon long-lasting conflict between tribes which in some ways prevented the Alliance from campaigning as a seamless military and political entity. In addition, individual tribes had their own respective interests to gain or lose in their relations with the Americans, which often interfered with the action that would best support the Alliance’s goals. The complexity of the relations within the Alliance further exemplifies the unique ideologies and priorities of each tribe and their respective culture. During the summer of 1793, tensions escalated between Anglo-Americans and Native peoples in the Ohio Country. Native scouts saw large quantities of incoming supplies to Wayne’s men and alerted American Indian leaders that Wayne was planning for an offensive campaign. On June 30, Little Turtle (Myaamia) led 1,500 Myaamia, Shawnee, Lenape, and Ottawa warriors in an attack on a supply train leaving Fort Recovery for Fort Greene Ville, killing or capturing many of the Anglo-American settlers. However, the American Indian warriors were unable to dislodge the soldiers from Fort Recovery, resulting in many of the participating Great Lakes Tribes returning home, including the Iroquois, which would prove to be a devastating loss of warriors for the Battle of Fallen Timbers. In late July, Wayne moved into northwestern Ohio and by early August, he ordered his men to construct Fort Defiance in Defiance, Ohio, to protect his army as well as to serve as a supply depot. During this time, Wayne's troops also destroyed many American Indian villages and their crops, thereby destroying their life-giving food supply. The construction of Fort Recovery made Little Turtle very concerned about the military effectiveness of Wayne’s army, and therefore urged the Indian Alliance to make peace with Anglo-American settlers. The Alliance refused to consider his proposal, and Little Turtle’s leadership position was replaced with Turkey Foot, chief of the Ottawa tribe. The Myaamia were one of the strongest supporters of combating the United States’ military forces with violent resistance, as the Myaamia continued to be unable to defend their homes and food sources from Wayne. Once Wayne confirmed that the Confederation would not commit to a peaceful treaty, he and his Legion of 3,000 troops, along with a large number of Kentucky volunteers, marched for battle along the north side of the Maumee River to a place now called Fallen Timbers due to the array of fallen trees toppled by a tornado. Tribal military leaders chose this area for the battlefield because the fallen trees were ideal hiding locations for warriors to utilize in ambushing Wayne’s men. Wayne’s cavalry would have difficulty advancing its horses over the fallen trees, and the location was close to Fort Myaamia where they could be resupplied by their British allies. However, with only 1,400 warriors, the Alliance warriors were vastly outnumbered and could not combat Wayne’s well trained and disciplined troops. Their most important strength, ambush and direct attack, could not be effectively executed against Wayne’s artillery, infantry, and cavalry. Thirty-three of Wayne’s men were killed and roughly one hundred wounded, while the American Indian Alliance lost approximately twice that number. Blue Jacket's (Shawnee) followers retreated to Fort Myaamia, hoping the British would provide them with protection and assistance against Wayne's army, however the British refused to let them into the fort. Wayne followed the warriors to the fort. Upon his arrival, Wayne ordered the British to evacuate the Northwest Territory, but the British commander refused, and Wayne decided to withdraw to Fort Greene Ville. For the next year, Wayne stayed at Fort Greene Ville working to negotiate a treaty with Tribal leaders. The Tribal negotiators and leaders realized they were at a serious disadvantage with the settlers, especially because of Britain's refusal to support them. On August 3, 1795, representatives from the Myaamia, Wyandotte, Shawnee, Lenape, Ottawa, Ojibwa, Potawatomi, Kickapoo, Kaskaskias, Eel River, and Weas signed the Treaty of Greene Ville. In signing the treaty, these tribes agreed to move to the northwestern part of what is now the State of Ohio. Championed as a treaty of friendship between Anglo-American settlers and American Indian tribes, the treaty forced tribal leaders to relinquish much of their land to Anglo-Americans. However, the treaty did not subdue tension between American Indians and settlers, and Tribal leaders continued to fight to regain their lost land. Bloodshed dominated the region for the next twenty years as settlers and American Indians struggled for control. In the early 19th century, thousands of American Indian peoples from the Ohio Country and the Great Lakes region joined Tecumseh and his brother Tenskwatawa at Prophetstown, Indiana, where they were building a new Indian Alliance as a united force to stop the sale of Indian land. The Fallen Timbers Battlefield Memorial Park is a National Historic Landmark and one of the historic sites co-managed by the Ohio History Connection and local officials. Located near the Maumee River, the park includes monuments honoring the warriors and soldiers who perished during the battle - including Major General Anthony Wayne, his soldiers, the American Indian leaders, and many warriors. The Fallen Timbers Battlefield site is located directly across the road from the Memorial Park.